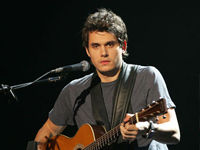 John Clayton Mayer was born October 16, 1977 and is an American guitarist and singer-songwriter. Originally from Connecticut, he attended Berklee College of Music, before moving to Atlanta, Georgia, in 1998, where he refined his skills and gained a following. His first two studio albums, Room for Squares and Heavier Things, did well commercially, achieving multi-platinum status. In 2003, he won a Best Male Pop Vocal Performance Grammy for “Your Body Is a Wonderland”. Mayer began his career performing mainly acoustic rock and pop, but gradually began a transition towards the blues genre in 2005 by collaborating with renowned blues artists such as B. B. King and forming the John Mayer Trio. The blues influence can be heard on his album Continuum, released in September 2006. At the 49th Annual Grammy Awards in 2007 Mayer won Best Pop Vocal Album for Continuum and Best Male Pop Vocal Performance for “Waiting on the World to Change”. Mayer’s career pursuits have extended to stand-up comedy, design, and writing; he has written pieces for magazines, most notably for Esquire. He is also involved in philanthropic activities through his “Back to You” fund and his concern over global warming. John Mayer was born in Bridgeport, Connecticut to Margaret (an English teacher) and Richard (a high school principal). He grew up in nearby Fairfield, the second of three sons. There, he became friends with future tennis star James Blake. Mayer mostly attended the former Fairfield High School, although he was enrolled in the Center for Global Studies at Brien McMahon High School (in Norwalk, Connecticut) for his junior year. (Then known as the Center for Japanese Studies Abroad, it is a magnet program for students wanting to learn Japanese.) Mayer listened to pop music as a child. During an appearance on Late Night with Conan O’Brien, he said that he had played the clarinet for a while in middle school, with minor success. After watching the Marty McFly character’s (Michael J. Fox) guitar performance in Back to The Future, he became fascinated with the instrument. Subsequently, at the age of thirteen, his father rented one for him. Soon after getting his guitar, his neighbor gave him a Stevie Ray Vaughan cassette, which began Mayer’s intense love of the blues. Despite the reservations of his parents, Mayer became consumed with playing the guitar, and after two years of practice, he started playing at blues bars and other venues in the area, while in high school. In addition to performing alone, he was in a band called Villanova Junction with Tim Procaccini, and Rich Wolf. When Mayer was seventeen, he was stricken with a cardiac arrhythmia that sent him to the hospital for a weekend. Reflecting on the incident, Mayer said, “That was the moment the songwriter in me was born,” and he penned his first lyrics the night he got home. Shortly thereafter, he began suffering from crippling panic attacks, and even now he keeps Xanax, an anti-anxiety drug, with him. After graduation, he worked for fifteen months at a gas station until he saved up enough money to buy his first proper guitar—a 1996 Stevie Ray Vaughan signature Stratocaster. Mayer enrolled in the Berklee College of Music in Boston, Massachusetts, at the age of nineteen. After two semesters, he chose to cut his studies short, and at the urging of his college friend and Atlanta native, Clay Cook, the two moved to Atlanta, Georgia. Quickly making a name for their two-man band, LoFi Masters, they began their career in earnest there, frequenting the local coffee house and club circuit in venues like Eddie’s Attic. Cook has said, however, that they began to experience musical differences due to Mayer’s desire to take the duo in more of a pop direction. The two parted ways, and Mayer embarked on a solo career. With the help of local producer and engineer Glenn Matullo, Mayer recorded the independent EP Inside Wants Out. Cook is also cited as the co-writer of many of the songs from the EP, most notably, Mayer’s first commercial single release, “No Such Thing”. The EP includes only eight songs, all with Mayer on lead vocals and guitars, with the exception of “Comfortable” in which Mayer only recorded the vocals. For the opening track, “Back To You”, a full band was enlisted, including the EP’s co-producer David “DeLa” LaBruyere on bass guitars. Mayer and LaBruyere then began to tour throughout Georgia and the surrounding states. Mayer has a number of tattoos. These include: “Home” and “Life” (from the song title) on the back of his left and right arms respectively, “77″ (his year of birth) on the left side of his chest, and a koi-like fish on his right shoulder. His entire left arm is covered in a sleeve tattoo that he acquired gradually, ending in April 2008; it includes: “SRV” (for his idol Stevie Ray Vaughan) on his shoulder, a decorated rectangle on his bicep, a dragon-like figure on his inner arm, and various other floral designs. In 2003, he got a tattoo of three squares on his right forearm, which, he has explained, he will fill in gradually. As of 2008, two are filled. He is an avid collector of watches and owns timepieces costing into the tens of thousands of dollars. Mayer also has an extensive collection of sneakers, estimated (in 2006) at more than 200 pairs. Mayer dated Jennifer Love Hewitt briefly in 2002. In a comedy routine in May 2006, he joked they never consummated their relationship; he later apologized to her for the raunchy routine. Despite rumors to the contrary, Mayer did not date Heidi Klum in 2003. Mayer dated Jessica Simpson for about nine months, beginning in the summer of 2006. Rumors started in August of that year with a People magazine article, but kicked into high gear when Mayer and Simpson spent New Year’s holiday together in New York City, both attending Christina Aguilera’s New Year’s Eve party. On the red carpet of the 2007 Grammy Awards, Ryan Seacrest asked Mayer about his relationship with Simpson, but Mayer cryptically responded in Japanese. Despite some initially conflicting translations, he said, “Jessica is a lovely woman, and I’m glad to be with her.” Simpson also accompanied Mayer for several dates of his 2007 Continuum tour, and the two went on a trip to Rome in March of that year. However, the couple split in May 2007. He began dating actress Minka Kelly in September 2007, although the two broke up before the year’s end. Mayer also dated Jennifer Aniston. Mayer splits his time between his home in the Los Angeles suburbs (with his roommate and sound engineer, Chad Franscoviak) and his apartment in the New York City neighborhood of SoHo.